Another day, another Plow United 7". I'm not sure that's how the old saying goes, but I would be totally fine if it was. When a band is consistently cranking out so many great songs, you'll never hear me complain about new records to pick up. This time, Plow is paired with The Scandals. They're a band I've never really heard of prior to listening to this record. Despite their name, I can confirm that The Scandals are not a ska band. This 7" is arranged with a song by each band on each side as opposed to each band taking a side. I've never been a big fan of that, so I'm going to lump the songs back together for the purpose of this review. Plow United gives two more killers. "Coda" starts off with the band's two thousand mile an hour drum and guitar attack. The song races through the chorus and then slows down and hits that perfectly timed hook for a gigantic chorus. So, so great. "I'm Onto You" is a bit more reserved, but every bit as catchy. It's got a very slight greaser vibe to it and reminds me a bit of early Social Distortion. Just a bit. The Scandals turn in two songs. "Second Thought" starts off with some Against Me sounding vocals over a light guitar riff intro. The songs eventually builds into an upbeat rocker and it's a pretty fun song. "Sirens" also starts out with just guitar and vocals before the rest of the band kicks in, though they get to things a bit quicker on this one. It's solid mid tempo punk rock and the Against Me vibe is even stronger on this one, especially in the vocals. Pretty catchy and a good listen. It never crosses into being a truly great song, but I have no complaints. 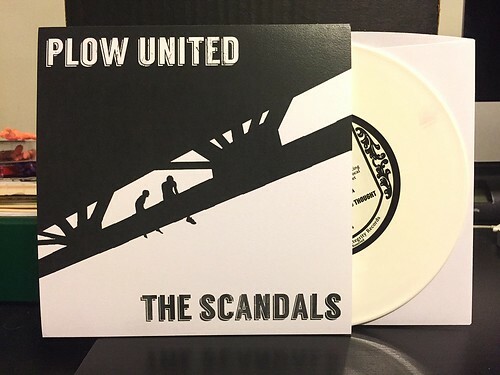 As I've said before, I'll buy any Plow United split 7" regardless of the other band. Having that other band be pretty good is just a nice bonus.